What is Superlinks Advertising Network? Superlinks is a display advertising service provider used to serve small and large publishers with CPM based ad units of many kinds for their desktop and mobile blogs, content websites, forums, news sites, communities, resource websites, e-commerce or any other type of sites where these ad units can be placed and monetize the traffic. Superlinks is a division of AdManage S.A. and was created to offer creative and new advertising formats for publishers to be able to earn highest CPM rates for their ad inventories through ad exchanges. It is focused with the goal of increasing the publisher’s ad revenue from 125% up to 300% with most profitable tools for monetizing your website’s ad space. Superlinks is partnered with Doubleclick ad exchange by Google, OpenX, and Appnexus to serve only best brands within the ad tag. There are no such hard requirements to become a superlinks publisher as the network is built for all types of publishers, big or small, but it needs quality website traffic to quality content on your website. There is no such required monthly visitors thing, but it does have some content policies which states for no violent, mature or non-safe content on your website, existence of which may not approve your application to Superlinks. Traffic sources which are not allowed are traffic from the torrent, file sharing, and adult sites and the traffic must be gained primarily from organic sources. It converts all the links on a page to super exit links where if a user clicks a link, it shows a banner advertisement for 35 seconds before going to the destination page. The user may also skip the ad in between. Place the display ad banners of any size on your website which analyzes the user’s past browsing behaviour and the type of content on that page before delivering the right and relevant ad to the user after collecting bids from thousands of advertisers for that inventory. A super interstitial ad appears before displaying website’s content. It is similar to super exit links where the user can skip or view the ad for 35 seconds. The ad is displayed on the footer area of the website which is related to the content and user’s pattern of visits to other sites across the web. It easily catches the attention of the visitor and so is good for the advertisers. The ad can be a display or text based ads. High paying 160 x 600 skyscraper ad units appear alongside the content on both sides of the web page. As superlinks is associated with Appnexus, OpenX, and Google, all geos are covered worldwide. As per Superlinks recommendations, ad units should not be placed in popups, pop-unders, exit windows or other similar methods. After you were approved for Google Ad exchange program by applying for it within Superlinks, you would get to have Google ADX DoubleClick ad units on your website which would increase your earnings definitely by many times. As per Google ADX rule, you may have up to 5 ad tags on your site. The units have DoubleClick ads and Google AdSense ads as backfill. Superlinks pay out on Net 35 basis, that is after 35 days of the current month. It gives you the following payment options: PayPal, wire, and Payoneer. The minimum monthly threshold is $100 for PayPal and Payoneer and $500 for wires. 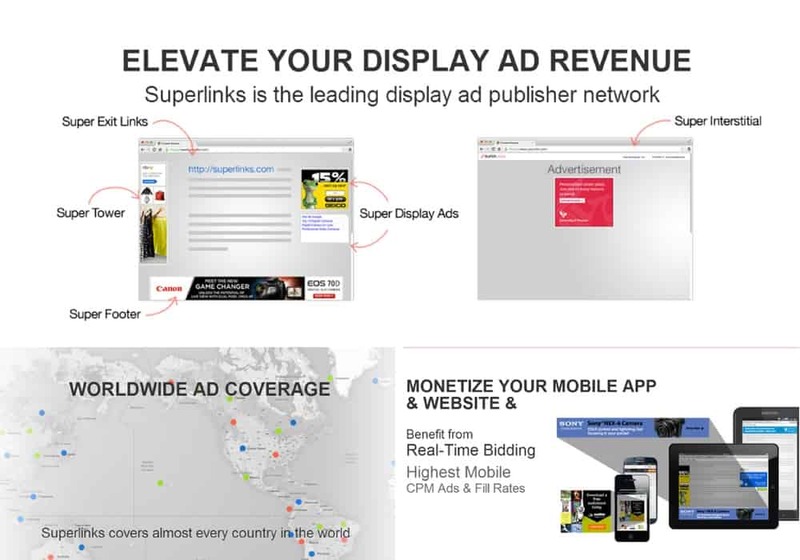 You can monetize the desktop website, mobile view and mobile apps with superlinks display ads. Here is an official video brought up by Superlinks Network. Apply now to the Superlinks advertising network for free. If you are approved for the network, you would get an email from them and you can start monetizing your inventories from there on. Go to ‘My Widgets’ and click on ‘Add New Widget’ to create a new ad widget of your choice. If you choose to create a new super display ad widget, enter your widget name, website to be placed on and the ad unit dimension. As soon as the widget is approved, just copy the ad code and apply on your blog. For all the widgets you created, either for super display or for the super exit, you will find all those in ‘Widget Manager’. For Google ADX ads, find the Google Signup URL within the Superlinks dashboard and fill in the form and wait for the approval from Google. With the approval, you would be taken into the Google DoubleClick ad exchange program after some time and from a point you would see your eCPM rise appreciably. Superlinks seems to be a very profitable ad exchange network with great customer support for any help and you would definitely see your advertising revenue increase. Sign up now, it’s Free. This article was published in Internet and tagged Advertising, Make Money Online, Superlinks. I have placed superlinks advertisements on my blog/website http://www.webcodeexpert.com. I am highly satisfied with its earning. I have also placed chitika and infolinks but superlink’s earning is more than the other two. Recently I got approval from Superlinks but even after placing codes for 3 days not a single ad is displaying. I have not used superlinks. Will try this on http://www.bookhut.net. By the way I am using epom, another great ad network. I will like to try on http://www.realgamesplay.com. I am using superlinks after reading your post. Even after 14000 impressions my earning are zero. Can you tell me the reason for this. Hello Jinka, sometimes there tends to be some delay in reporting of earnings data on Superlinks dashboard with tracking of impressions on work before the final earnings report. As your ad tags might be new for your website, I suggest you to give it some time. You may call Superlinks Support for this issue at [support@superlinks.com]. Did you finally get some earnings out of Super links? I have just implemented it on my website and I have been waiting to see any gain. Well, even after 5 days, I dont see any earnings even though there are more than 30K impressions. I am now getting worried as I removed my Chitika and infolinks ads in favour of superlinks. Even iam facing same issue its been 11 days , still my dashboard shows nothing, i have raised two tickets but still no response. Superlinks is a great advertising service but it is a common problem that they can even take a month to deliver you with your analytics report for your website in the beginning. I would say, check your site’s approval status and contact their support directly via email instead of the support tickets and ask them if everything is working correctly. Just writing this comment for the benefit of other users – The earnings finally did show up, however I had to write to their support and they kind of updated the data. Also, I think it is not based on impressions. The earnings correspond to only clicks. If there are no clicks then no earnings. I am yet to receive any payments from them though. Also note – Their reports are never updated on weekends. that will definitely give some boost to other commenters who use Superlinks. I need some help here regarding superlinks. 1. Superlinks pays through paypal and i found while searching on Google that paypal don’t allow this for India. No personal Payment through paypal in India. Then How to receive payment? Please give me suggestion if you have some experience here. 2. No reports since I added ad code on my site. Not getting reply from support forum as well. What to do? I am also approved by Adversal. Is Adversal better than Superlinks? Should I use their ad? 1. Yes, there may be some issue regarding paypal for indian users, but as of now, I do not see any problem of payments from Superlinks and foreign networks in my paypal account. All my received payments to paypal are transacted properly into my bank account without no issue. If you do not want to receive payments through Paypal, there is another option of Payoneer instead of Paypal, so you can definitely continue with your superlinks ads. 2. As i said, there is a common problem of delayed reports, so you have to wait after creating your account and implementing their ads on your site and this also applies to their support. Adversal is different from it in the sense that it allows you to add your site and shows you the bidding status from its advertisers for your site. The more higher the bid, the more you get and it depends on the overall quality and traffic to your site. Superlinks get you the ads from Google Doubleclick for publishers and thus is more relevant to your page content and has more potential earnings. So, Adversal is also a good option for anyone if there is no approval from superlinks. It’s been a week and they haven’t replied yet. No approval or disapproval. Kinda bad! Its been almost a week iam not able to login in to my account in superlinks, i have raised two tickets but without any luck. i have reached minimum payout amount a week ago. Are they genuine? hey i am a publisher of superlinks since december 2014. i have above $750 in my account and my dec 2014 payment is pending since 5th Feb 2015 i have contacted them they didn’t even reply me and now m not able to access my account even. if any one from superlinks please lookinto this isssue. am getting approved from Superlinks 3 days before for my blogspot blog http://www.freshersjobsaadda.blogspot.in , and also i implemented code into my blog but ads are not showing since from 3 days, instead of ads it shows only white space, what can i do.. please help me!!!!!!!!!!!! I should suggest you to contact the ad team and ask them if they allow subdomain blogs to show their ads, like on blogspot, wordpress.com, and other similar blog platforms. Very Good I guess superlinks is best alternative after Google Adsense. I will try it hope i get approved easily. because adsense are very cruel to approve. Thanks For Sharing It. Here is My Site: http://www.scoopthatvibes.com & http://www.techoogle.com I will Try on both Blogs. Does superlink pay for clicks or only for impressions, If so can you tell me what is average CPC and CPM? Superlinks pay for impressions per ad space and not on the number of clicks as you can see it on their reports. But, at the same time, as there would be some valid clicks on their ads, there would be some return of investment (ROI) to their respective advertisers. More the clicks (genuine), more benefit to the advertisers, and therefore higher bidding to your ad space. This will ultimately result in higher eCPM and increased earnings to you. Talking about the average CPM rate, it all depends on your traffic quality, page rank and also on your content quality. It generally averages around $0.3 to $1.0 and higher for Google DFP program ads. Sisterads paying $20 eCPM i think currently this is good paying network. I am using for 3 months, it’s payment cycle NET-7 If you like pop-up ads you should try it. it`s good network for publishers average eCPM rate $10-15 and not below $5. Hi admin as per your suggest i have apply ads on my website i run the ads whole day but did not get a single penny. my daily traffic is around 9000 visitors is there a traffic requirement to for the website like they only accept united states traffic not asia? it is not that the network only credit for visitors from certain countries like U.S. The ads adjust automatically according to the location and other aspects. There would be no issue regarding traffic requirements. If you are approved for Superlinks and granted their widgets, you are in. It is just that you have to give some time to the network for it to gather just enough information so as to start showing you the details/report and update your earnings for every such days you have their ads running on your site. This ad network looks promising and i think i may try it on one of my blogs.